In June 2015 I went on my first trip with In The Saddle to Castle Leslie in Ireland. 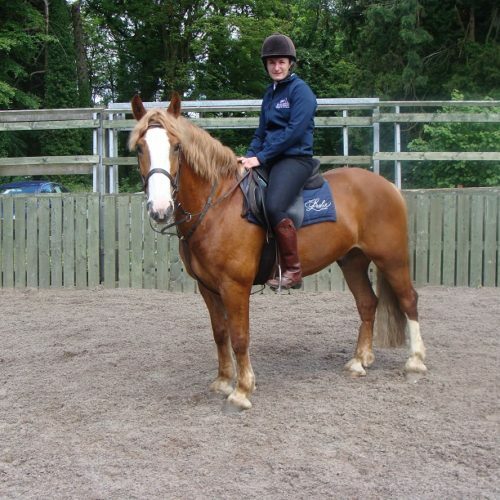 I am a qualified riding instructor and hold my BHS stage 4 and prior to working at In The Saddle I worked on some busy riding centres in the UK… so I was interested to see what Castle Leslie has to offer. First impressions were very good. The Equestrian Centre has a horse for everyone; from ponies to great big Irish Draughts; slow steady horses to the feistier forward going types; lean slim types to the heavy cob with a foot in every corner type! Jenny is the yard manager and obviously has a good eye for selecting the horses and their temperaments. Before you travel your riding schedule is booked and confirmed. This schedule is designed according to what you want to do and achieve during their stay. I would recommend you try everything during your stay. The facilities at the centre are great; they have a lovely big indoor arena in which you can have flatwork or jumping lessons which also has seating so that your non-riding friends can watch. The estate is just gorgeous and well worth riding around. Every corner reveals a different gate house, lake, field of horses, old building, and the list is endless. You could certainly do many estate rides and cover different parts every time. The cross country field is next to the beautiful lake with the Castle in the background. I have never seen so many different types of cross-country jumps and all were well maintained. There was a jump for everyone in this field, whether you are new to jumping and just wanted to trot and pop or if you wanted to have a blast at some of the bigger and tricky combinations. Most of our riding guests stay in the Lodge as it is right beside the riding centre. It is also possible to stay in the Castle, the Old Stable Mews or the Village Houses but these are further away from the Equestrian Centre. I stayed in the Lodge and felt like a princess in my huge double bed all to myself. The room also had a lovely seating area with comfy armchairs and a table. The bathroom was another huge room in its self with walk in shower and roll top bath. I don’t think anyone would be disappointed with the Lodge rooms. Another selling point to this ride is how easy it is to get to. It is within equal distance of Belfast or Dublin airports and we can arrange collections from wherever you need collecting from, whether that is the airport, bus station or a hotel. Overall I would say this holiday would suit any ability of rider. Don’t expect highly trained dressage horses or 4* event horses but if you want to ride genuine Irish horses then you will have fun and improve your riding. Castle Leslie offers so much with the opportunity for flat work, show jumping, having fun on the cross-county course or just exploring the estate from horseback. When I visited I kept a diary of my three night stay. I have made it into a blog which can be read here and hopefully it will give you a more in depth view of my stay.